Recent signing Marcus Maddison scored a classy first-half goal to set league leaders Peterborough United on their way to a convincing win over Port Vale. Maddison lofted the ball over goalkeeper Chris Neal from 18 yards to give Posh a deserved lead at the break. Substitute Kyle Vassell headed in Jon Taylor's free-kick to double the score and Jack Payne's fine shot made it 3-0. Jordan Slew scored with a thumping late strike but a fifth Posh win in six League One games was never in doubt. Slew's goal was some reward for an improved second-half display by the visitors. But Peterborough were good value for their win and their steady, clinical performance could easily have led to a greater margin of victory. Conor Washington almost opened the scoring but his effort was well saved by Neal and new signing Luke James made a mess of the follow-up, shooting over when well placed. Maddison grabbed his second goal in three games since joining from Gateshead when he scored from the edge of the box after a smart thinking from a quick throw-in. The visitors threatened more after the interval after playing two up front. But they struggled to create clear chances and only had Slew's late goal to show for their efforts after Vassell and Payne had made the points safe. Match ends, Peterborough United 3, Port Vale 1. Second Half ends, Peterborough United 3, Port Vale 1. Corner, Port Vale. Conceded by Christian Burgess. Attempt blocked. Jordan Slew (Port Vale) right footed shot from the centre of the box is blocked. Ricardo Santos (Peterborough United) is shown the yellow card. Kane Ferdinand (Peterborough United) wins a free kick in the defensive half. Corner, Peterborough United. Conceded by Chris Robertson. Attempt blocked. Kyle Vassell (Peterborough United) left footed shot from outside the box is blocked. Jordan Slew (Port Vale) wins a free kick in the attacking half. Christian Burgess (Peterborough United) wins a free kick on the right wing. Foul by Jordan Slew (Port Vale). Attempt blocked. Jon Taylor (Peterborough United) right footed shot from outside the box is blocked. Goal! Peterborough United 3, Port Vale 1. Jordan Slew (Port Vale) left footed shot from the centre of the box to the top left corner. Assisted by Mark Marshall. Substitution, Peterborough United. Grant McCann replaces Marcus Maddison. Attempt saved. Louis Dodds (Port Vale) header from the centre of the box is saved in the top right corner. Attempt saved. Kyle Vassell (Peterborough United) left footed shot from outside the box is saved in the centre of the goal. Goal! 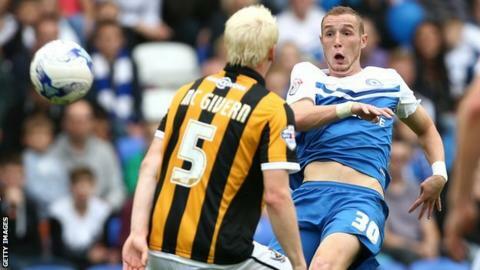 Peterborough United 3, Port Vale 0. Jack Payne (Peterborough United) right footed shot from outside the box to the top right corner. Assisted by Conor Washington. Kane Ferdinand (Peterborough United) wins a free kick on the left wing. Substitution, Port Vale. Louis Dodds replaces Byron Moore. Substitution, Port Vale. Ben Williamson replaces Tom Pope. Goal! Peterborough United 2, Port Vale 0. Kyle Vassell (Peterborough United) header from the centre of the box to the top left corner. Assisted by Jon Taylor following a set piece situation. Chris Robertson (Port Vale) is shown the yellow card. Foul by Chris Robertson (Port Vale). Corner, Peterborough United. Conceded by Ryan McGivern. Attempt blocked. Christian Burgess (Peterborough United) right footed shot from the centre of the box is blocked. Chris Neal (Port Vale) is shown the yellow card. Kyle Vassell (Peterborough United) wins a free kick in the defensive half. Foul by Chris Neal (Port Vale). Substitution, Peterborough United. Kane Ferdinand replaces Jermaine Anderson. Attempt saved. Mark Marshall (Port Vale) left footed shot from outside the box is saved in the centre of the goal. Attempt missed. Jon Taylor (Peterborough United) right footed shot from the centre of the box is too high. Attempt blocked. Jermaine Anderson (Peterborough United) right footed shot from the right side of the box is blocked. Attempt saved. Mark Marshall (Port Vale) left footed shot from outside the box is saved in the bottom left corner. Corner, Port Vale. Conceded by Jon Taylor. Foul by Jermaine Anderson (Peterborough United).